Knitting, spinning, food, and life as a Military Mom! I was inspired to create my own button-up neckwarmer after seeing YarnballBoogie's "Fourteen". Everyone at The Celtic Knot has been going ga-ga over the one we have knit up in Frog Tree Merino. I changed the pattern up quite a bit to suit my yarn and style. This pattern is done in a traditional Brioche stitch, with decorative crochet button holes. I found that traditional Brioche creates more defined ridges, when compared to Fisherman's Rib (the stitch used in the original pattern). Repeat the pattern row until you have only a few yards of yarn remaining. Bind off loosely, but do not cut your yarn. Using safety pins, mark the spaces where you want your button holes to be. They should be roughly 1/2-inch in from the edge on both sides, and one in the center. Row 1: chain 1, single crochet in the next two bound-off stitches. Chain 3. Skipping the next 2-3 bound-off stitches, single crochet in the following 5 bound-of stitches. Chain 3. Skipping the next 2-3 bound-off stitches, single crochet in the following 5 bound-of stitches. Chain 3. Skipping the next 2-3 bound-off stitches, single crochet in the last two bound-of stitches. Row 2: Chain 2, Double crochet 8 times in the hole formed by the "chain 3" button hole from the previous row. Single crochet to anchor the scallop. Double crochet 9 times in the next button hole, single crochet to anchor it, and repeat for the last button hole. Cut yarn leaving a 6-inch tail and pull the end through the loop to secure it. Weave in all ends. Attach your buttons up the left side of the neckwarmer, using your button holes as a guide. Wow, that is super sweet!! I love the crochet button loops, nice detail and those buttons! they are knockouts. Thanks for the idea! I had just finished knitting the body of my mother's cross stitch neck warmer when I saw your blog. I totally modified it to work for my project and it turned out great. Wow! I just stumbled across your blog. So happy to see my buttons put to such good use! Your scarf is beautiful. Thanks for the link to my button shop. My mom wants a neckwarmer for Christmas, and I've been scouring the nets for a perfect pattern- AND I JUST FOUND IT! I found some polarfleece yarn, and I can't wait to see how it knits up. Thanks!! Do you know cabal online alz? I like it. My brother often go to the internet bar to buy cabal alz and play it. After school, He likes playing games using these cabal gold with his friend. I do not like to play it. Because I think that it not only costs much money but also spend much time. One day, he give me many cabal money and play the game with me. I came to the bar following him and found buy cabal alz was so cheap. After that, I also go to play game with him. Do you know eve isk? I like it. My brother often go to the internet bar to buy eve online isk and play it. After school, He likes playing games using these buy isk with his friend. I do not like to play it. Because I think that it not only costs much money but also spend much time. One day, he give me many cheap eve isk and play the game with me. I came to the bar following him and found buy eve online isk was so cheap. After that, I also go to play game with him. I have been eying this pattern for a while!! I first discovered your Monk hat via google. The Monk hat was the first pattern that I've followed and on the 2nd attempt my hat turned out. :-) As soon as xmas is over, I'm going to knit this scarf for myself. Your style is so cute! Thanks for sharing your patterns. I really appreciate it! Can you tell me how long the neck warmer should be before binding off to make the crochet button holes? I'm using a different yarn, so I'm not comfortable just going with the directions of casting off when you have a few yards of yarn left. Thanks in adavance! Love the pattern!! I just started knitting this year and came across your blog, funny, I live near Wiesbaden as well. I just started making this and it is so awesome! So glad you shared this! Love reading the blog, especially the Christmas markets, been to the same ones! 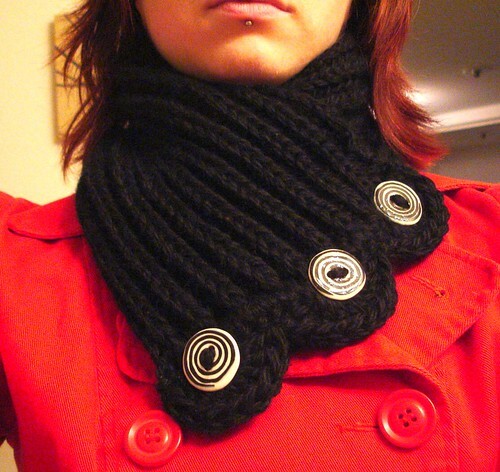 Do you know that your photo of your spiral button neckwarmer inspired me to pick up knitting again last September? I had stopped knitting 12 years ago but wanted to make a neckwarmer like yours, it is really lovely! I am now another 52 projects further on and completely obsessed. Happily so! Your spiral buttons have had quite an impact on me! 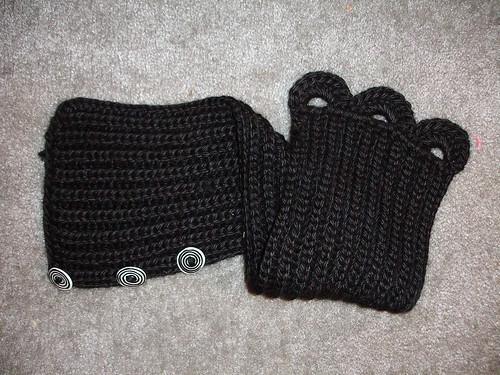 How do you start with a yo in this pattern.the swirl neck warmer.thank you! Hi Dennis! To start with a YO on the setup row, hold your yarn in front of your work, slip the next stitch as if to purl, then insert your needle into the next stitch to get ready to knit and bring the yarn over the top of the needle to complete the knit stitch. The new YO and the knit stitch will overlap, and this is good because you will be knitting them together on the next row. Hope that helps! This is sooooo nice!!! May I have a step by step how to knit this please? I'm new at this. Thank you so much. Is there anyway possible I could have you make me one like this? it is okay if the button wont be the same? Have been trying to figure out how to do a buttonhole in brioche however this is perfect! Just have to brush up on my limited crochet skills. Very quick scarf once you get into your zone. Please can you tell me the dimensions of this lovely scarf? Ancient Chinese folklore posits that people who are meant to meet in life are born connected by an invisible Red Thread, that may tangle, but never break. 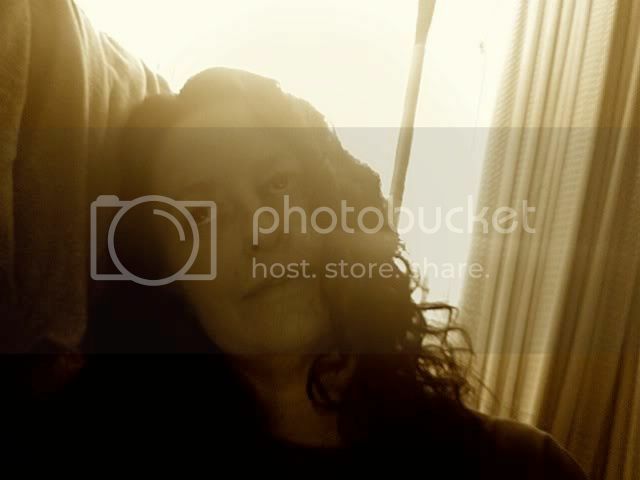 I hope to untangle some threads and find new connections by sharing a hobby that I love. Find me on Ravelry as RedThread. Currently living in Germany for 3 years! This is a Flickr badge showing items in a set called Finished Objects. Make your own badge here. My Monk hat made for Real Monks..er..Nuns!